With the fiber optics revolution for telecommunications in the 1980s, fiber optical technology became increasingly more advanced and higher quality. The telecommunications boom in the late 1990’s resulted in a dramatic boost to the technical capability of fiber optical technologies and associated optoelectronics. Radical improvements were made in superb quality, very long lifetime, and reduced price for many components: pump diode lasers, coupling, beam combiners, rotators, Bragg fiber filters, modulators, and detectors. Also, the fibers themselves have seen significant innovation over the last decade, with commercial availability of larger cores for higher power, double-clad fibers for multimode pumping, producing single mode lasers, and photonic band gap fibers for even more flexibility of fiber parameters. The advances in these fiber optical technologies were originally targeted to communication transport applications. Nevertheless, the reliability, compactness, cost, and quality advantages also have merit for creation of novel optical sources. Hence the origin of many companies based on developing fiber lasers, with Calmar Laser one of the first, incorporated as Calmar Optcom in 1996. In the last decade, companies such as IPG have been very successful in developing fiber laser technology for high power industrial applications. Although small core diameter fibers would seem an odd choice for kilowatt machining applications, they can indeed handle the CW power with superior heat dissipation. Also, the fiber laser reliability is a critical deciding factor in industrial applications. Companies such as Calmar Laser have focused more on ultrafast applications of optical fiber lasers. For these applications, the peak optical power in a small fiber core diameter creates many nonlinear issues relative to the solid state. But these issues are not all detrimental, and can often be used to advantage, such as to broaden or shift a spectrum as needed. Solid state lasers consist of a bulk crystal or glass gain medium pumped by a flash lamp or diode lasers. The beam propagates in free space through the gain medium with standard free space optics such as flat mirrors, lenses, and diffraction gratings to control the beam. On the contrary, fibers waveguide the light, confining it in a small core. Once the guiding fiber is doped with active elements such as erbium or ytterbium, the waveguide itself becomes a gain medium, amplifying the lights with suitable pumping source. Fiber lasers are beginning to supplant the traditional solid state laser in many areas. Here’s a summary of the advantages and disadvantages of each type. Applications where fiber lasers are considered the best choice today include high quality low power seed lasers; high average power CW lasers; compact lasers needs; or OEM applications where long term reliability and hands-free stability is required. 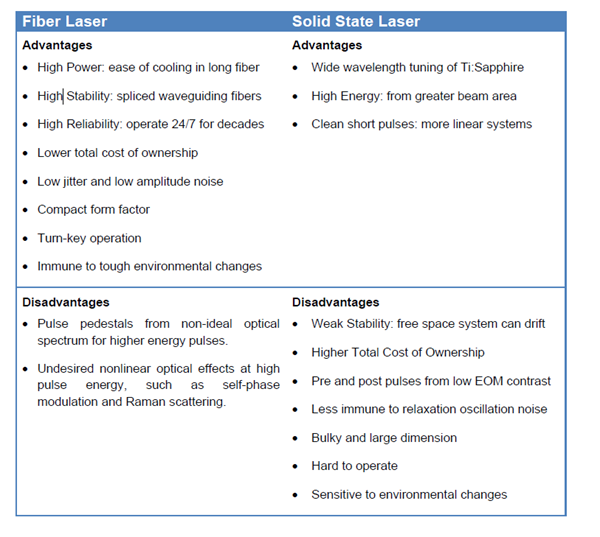 Applications where solid state lasers are considered the best choice today include high pulse energy and short pulse systems; laboratory systems where flexibility is needed and manual realignment is acceptable; or a very wide turning range is needed such as a Ti:Sapphire system. Also, a high power solid state system will often start with a stable fiber laser seed source for lower cost, smaller size, and greater reliability. Calmar Laser’s femtosecond laser sources are passively or actively mode-locked fiber lasers. Passive mode-locking makes these lasers easier to operate than actively mode-locked lasers, as no external RF clock signal is required, and little or no warm-up time is needed. Temperature control is also less of an issue with passively mode-locked lasers. Also Calmar Laser’s passively mode-locked lasers can produce pulses as short as 80 fs long. Repetition rates are fixed in the range 10 – 100 MHz, depending on cavity length. The peak output power of a femtosecond laser is, of course, high due to the short pulse durations, and peak powers up to 10 KW can be achieved using an integrated EDFA. Figure 1 shows a simplified schematic of a passively mode-locked fiber laser. Since Calmar’s fiber lasers are manufactured from discrete components, dispersive and non-linear effects can be carefully controlled. Pulse shape is transform-limited, and the pedestal is typically 20dB lower than the signal. The RZ pulses from Calmar’s lasers are ideally suited for testing and characterization at 40 Gb/s and higher. Wavelength can be tuned from 1535 nm to 1560nm with a simple adjustment from the front panel of the laser. The capability to phase-lock the repetition rate to an external clock is available as an optional upgrade. In this scenario, a low jitter phase lock loop precisely tracks the laser repetition rate to an external clock. This feature is particularly useful for optical sampling applications. Calmar’s lasers are recognized for their stability, as demonstrated by their low timing jitter and low amplitude noise, thereby ensuring that the quality of the laser output meets even the most stringent test requirements. Femtosecond fiber lasers are an ideal source for testing the impulse response of optical receivers. Calmar’s femtosecond lasers, which can have a pulse width as short as 80 fs, can be used to test optical receivers with bandwidths larger than 200 GHz. Fiber lasers can handle large amounts of average power, and are often the choice for high power systems. The passive fiber is transparent and low loss. The gain fibers are long and thin, allowing effective cooling of a large amount of heat. Furthermore, most of the heat loss is generated in a diode laser separate from the fiber, and the fiber gain can be relatively efficient with low amounts of heat generation. As an example, single mode fiber lasers with output power in the kilowatt regime are used for industrial applications such as machining. However, these high power lasers are operated in CW or long pulse mode. 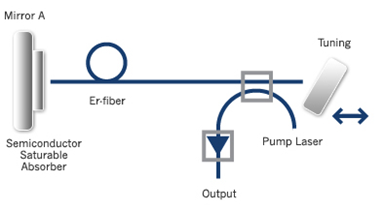 The only issue is how to get enough laser pump power into the fiber. This has been solved by the use of double-clad fibers that allow multimode pumping in the large cladding area while the single-mode signal is generated in the small core region. Thus the output of many high power laser diodes can be coupled into the same double-clad fiber simultaneously with various coupling schemes. Ultrashort pulses are a new technology with many applications from sampling to non-thermal machining. Fiber lasers provide a stable and reliable mode-locked platform for generation of these pulses. Ultrashort fiber lasers are the primary expertise of Calmar Laser. But high-energy short-pulse light propagating in a small diameter fiber creates numerous nonlinear problems. First is the generation of self phase modulation. The light power itself will change the index of refraction in which it propagates. It causes, in many cases, undesirable effects such as optical spectral broadening and ill defined frequency chirp that prevents efficient pulse compression. A second problem is stimulated Raman scattering, or the creation of new light at shifted wavelengths via molecular vibration states in the glass fiber itself. Once triggered, it depletes the power in desired signal wavelengths, often limiting ultimate obtainable energy from the fiber system. These nonlinear effects can distort pulse shapes and modify the optical spectrum. Although the effects are usually detrimental, they can sometimes be useful in different manipulation, such as a Soliton wave, or for expanding the gain spectrum to get a shorter pulse. Ultrafast fiber lasers are dominated by nonlinear optical effects, which is rare in the free space optical world. Fortunately, Calmar knows how to deal with the effects and with proper engineering can use nonlinear optical effects to advantage in laser systems. As the peak power of the light increases, the nonlinear effects become stronger. Several methods are used to lower the peak intensity effects, to allow more pulse energy to be handled. First, the short pulse is spread out in time by frequency, or chirped. A typical method uses a diffraction grating pair, although fiber counterparts exist. After the pulse has traveled through the fiber optical system, the pulse can be recompressed back to an ultra-short pulse. This recompression may need to be done in free space if the peak pulse intensity is too high to allow further propagation in a fiber. Second, a larger diameter fiber core can be used. Recently, large mode aperture fibers have been developed that can increase the fiber area by an order of magnitude or more, while remaining single mode. Finally, new photonic band gap fibers use an air core with much less nonlinear effects. These PBG fibers are just emerging and not yet reaching commercial use. As the optical pulse energy increases, fiber damage may occur, usually at the entrance or exit of the fiber. However, this damage limit is usually well above the effects of nonlinear processes within the fiber. In sum, fiber lasers can generate and handle very high average powers, in the kilowatts and above. But short pulses provide serious challenges. Today, the practical limit of sub-picosecond pulse generation in a fiber is in the 10s of μJ, and then only with an external re-compressor. The following test results give an indication of the performance of Calmar’s Femtosecond Fiber Lasers. A fiber laser system can easily be rack mounted, or placed as a module inside customer equipment. Access is not required as the fiber laser will stay aligned for the life of the laser. A fiber laser looks and operates much like any other electronic instrument. No special care or periodic maintenance is required other than recalibration as desired.